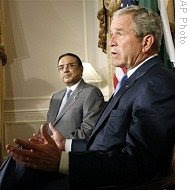 NEW YORK, Sept 23 (APP): President Asif Ali Zardari and President George W Bush discussed strengthening bilateral relationship here Tuesday, with the U.S.leader acknowledging Pakistan’s sovereignty and pledging continued support for the country’s in economic and security fields. Bush welcomed the newly elected Pakistani leader at The Waldorf Asotria Hotel as they met on the sidelines of the 63rd UN General Assembly session. At the outset, the US leader expressed a profound sense of grief over the loss of life in the weekend bombing on the Marriott Hotel, Islamabad. prosperity and we can work together, and of course we’ll be talking about security,” Bush said in reference to economic cooperation and anti-terrorism efforts.